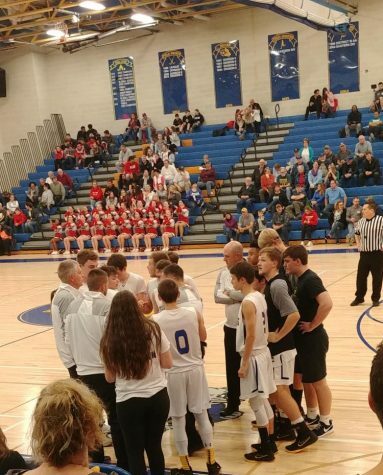 On December 21, the Varsity Boys Basketball team played a home game against the Susquehannock Warriors. An explosive scoring third quarter helped the Rams in their win over the Warriors, 68-59. The Ram’s starters were: sophomore point guard Carter Day, senior shooting guard Jordan Day, junior small forward Zachary Waltrup, junior power forward Wyatt McCleary, and senior power forward Garrett Lowe. Susquehannock won the tip-off to start the game. After both teams started the game with empty possessions, Susquehannock fouled Jordan Day and he scored the first points of the game. Lowe scored a few possessions after strong defense to get the Rams off to a 6-2 lead in the beginning of the game. The strong start did not end there, however. The Warriors clearly needed to make adjustments after Jordan Day made a 3-point shot and Carter Day scored. The Rams led 11-2 at the time of the Susquehannock timeout. “We had a game plan that we were able to execute right from the start,” Roupe said about the Rams’ strong start to the game. The Warriors drew back within four points, trailing 11-7 with about three minutes left in the first quarter. The Warriors wound up coming all the way back to tie the game at 11 with about a minute and a half left in the first quarter. A little later in the first quarter, Carter Day made a 3-pointer to break out of the Rams scoring drought, but Susquehannock matched it. 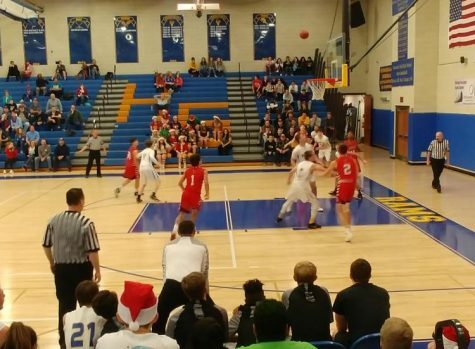 Then, on what some spectators may think was a questionable foul call on junior guard Joshua Vipperman, Susquehannock went to the free throw line and made both free throws, taking the lead to 16-14. However, the Rams were able to earned the lead 17-16 before the end of the first quarter. The second quarter started with both teams trading baskets, and the Rams still held the lead 23-20 with about five minutes left in the second quarter. Earlier in the game, it looked as if Waltrup may have been injured, but with about four minutes left in the second quarter, Waltrup came back in. “We made a few mistakes, and Susquehannock made a nice run and made some shots. 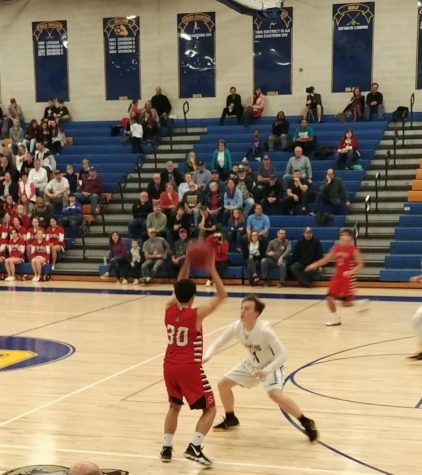 We made some shots and then we were able to close out a defensive possession and take the lead into halftime,” Roupe said about how the Rams finished the first half.A few minutes later, Susquehannock scored to take the lead 26-25, and later extended their lead to 28-25. But once again, the Rams were able to come back and take the lead 29-28. Lowe and Carter Day both contributed to this score. 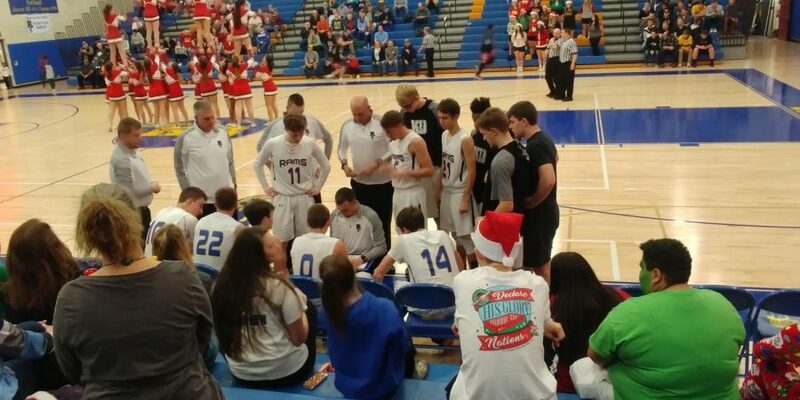 The third quarter started with both teams trading baskets, but with about seven minutes left in the quarter, the Rams started what was an 11-0 scoring run. That scoring run got the Rams out to a 40-30 lead. Susquehannock ended the Rams scoring run with a free throw with about four minutes left in the third quarter, but the Rams still led 40-31. In the last few minutes of the third quarter, the Rams exploded on offense and extended their lead to 51-37. The Ram’s offense got off to a slow start in the fourth quarter, but Carter Day made a 3-pointer to get things going. While the offense got off to a slow start, the defense played strong. Carter Day’s great night continued with about four and a half minutes to go in the fourth quarter as he scored again and made the and-1 free throw to extend the Rams’ lead to 57-49. It seemed like Carter Day took over in the last four minutes of the game; he scored a few more times to strengthen the Rams lead to 61-49. With about 30 seconds left in the game, Susquehannock scored to draw back within eight points, the Rams lead 64-56. And, wanting to get the ball back, Susquehannock fouled Carter Day on the next possession. He made one of two free throws and took the Rams lead to 66-59. On the next possession, the Warriors made a 3-point shot to cut the Rams lead to six, 65-59 was the score. Then, with about 17 seconds left in the game, Susquehannock fouled Carter Day again. He made one of two free throws again, and the Rams led 66-59. On the next possession, some exceptional defense kept the Warriors from scoring. The Warriors did foul sophomore guard Drew Dressel so that they could get the ball back. Even though Dressel missed both free throws, Lowe got the rebound and then he got fouled. Lowe made both free throws to seal the victory for the Rams, 68-59. This win improved the Rams’ record to 3-4 on the season. McCleary also commented on how well the team executed. Carter Day lead the way in terms of scoring for the Rams with 39 points. Lowe was also one of the leading scorers, he had 14 points. “Carter definitely stepped up and played his game. Scoring 39 points isn’t easy, especially when the other team is focused on stopping you. Not only did he play well, but his effort and heart on the court was contagious and our entire team fed off of it, which helped others step up and resulted in us getting the team win,” Roupe said. Even though Carter Day had an incredible night, Roupe said that his team was successful because they played as a complete team.